Gentle Scale Modelling: Three models finished - is this a record? Three models finished - is this a record? Since the last blog I have managed to complete three models. Each had its own problems but then I wouldn't be happy if everything went to plan - would I? This was made for the Ipswich IPMS monthly meeting. TheOctober meeting had a theme - F-86 - so I thought that, just for once, I would build an entry. I wanted to do an RAF one on the basis that most people would build out of the box and thus come up with US examples. This meant that I had to start buying! First off, finding a nice 1:72 F-6 wasn't that easy so I settled on the Hobby Boss version, forgetting that it was one of their "easy" kits. This means that the fuselage is in one piece and there is a minimum number of parts. I started out by knocking off the probe on the starboard wing - brilliant beginning as usual. I got some way through the kit and realised that it wasn't the best in the world so went back onto my trusty suppliers and purchased am Academy kit of the same aircraft. The Academy kit had a terrible fit around the cockpit so I went back to the Hobby Boss. I did recover the probe from the Academy kit and installed it on the Hobby Boss one so it wasn't a complete waste of time. I also purchased a sheet of decals for RAF/RCAF Sabres and chose one for Squadron Leader A.F. Osbourne, DFC, from 66 Squadron, Linton-on-Ouse in 1954. In the end, I was quite pleased with the result. There were only four F-86 on the table and one was a "work-in-progress". I haven't seen the report of the meeting but I bet that no one voted for mine. The Ipswich club meeting for November had a WWI theme (to tie into the 100th anniversary of the armistice) so I thought that I would break the habit of a lifetime (well almost) and build a WWI plane. The last time that I did this I was around 15 years old when I built a 1:72 Merit Albatros. I picked the Eindecker, now, as I had a plan. I was going to rig this using the black stretchy thread that I bought some time ago. The kit went together very well. I had plans for the rigging. The plan was - drill holes where the rigging goes into the wings; lightly attach the rigging to a piece of wire and thread it through the holes; glue the ends where needed. Unfortunately, the "lightly attach the rigging to a piece of wire" failed miserably as the hole that I would have had to drill would have been way to big and looked dreadful. Plan B was to fit wires through the holes with super glue and attache the stretchy thread to that. This resulted in a dreadful mess - super glue blobs all around. Then, when I cut one of the wires, I cut it too close and the mount was lost. Lastly, I ran out of the black thread with two left to go so my old Aeroclub white thread was called into action. 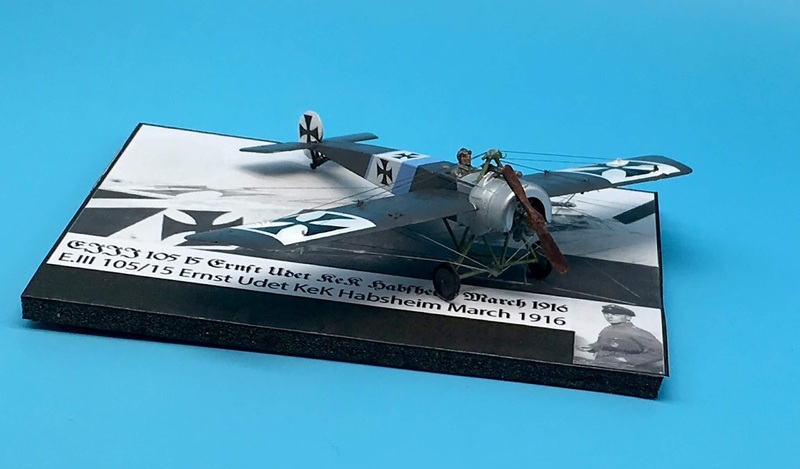 In the end, it was done and I now have a little model of Ernst Udet's EIII. I decided that I couldn't face going to the Ipswich club as I always feel like an outsider there. Never the less, it looks OK in a photo and from a distance. It has inspired me to have a go at a 1:48 Eduard version or maybe even the 1: 32 Wingnut Wings. My friend, Mark, has promised to show me how to make turnbuckles. Wow! 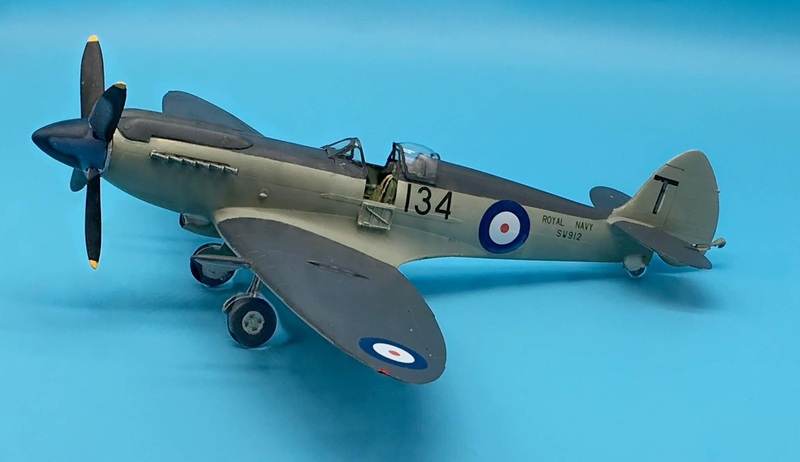 Special Hobby 1:48 Supermarine Seafire Mk.XV. "Far East Service"
This was purchased to complement the 1:48 HawkerSea Hurricane. I was a bit wary, having had problems in the past with these supposedly short run kits. However, it went together reasonably well. There was one difficult moment. I was working on the cockpit and released the front bulkhead from the sprue. I left it on the table whilst I did some other work on the seat. When I turned back to it, the part had disappeared. Now the first thought was that the "carpet monster" had it but lots of searches by both me and my wife failed to find it. In the end, I used the rear bulkhead as a model and created a new one. Everything else went according to the instructions and I had no further issues, including using the Eduard seat belts. The serious problems came when I started to put the decals on. 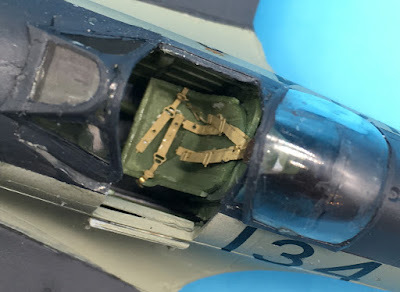 I chose a set of markings for early 1946 but the first decal that I tried to put on the plane broke up into little pieces. Because all the markings in the kit used these decals, I wasn't able to complete the aircraft. The way out was to buy a new set of decals. Soon, from my regular suppliers, came a set of Kits World decals for Seafires. On arrival, I realised my mistake - all of the aircraft on the sheet were bubble canopy versions. Back to the ordering page and a set of Model Alliance decals arrived shortly after. These are for the same style of Seafire as I had but - not quite -. However, these were the only two sets of decals available for the Seafire so I had little choice but to go with the later set. 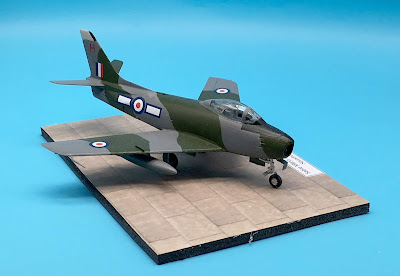 The only FAA one that fitted the colours that had painted the model was SW912, "134/T' of 804 NAS, HMS Theseus, 14th Carrier Group, February 1947. 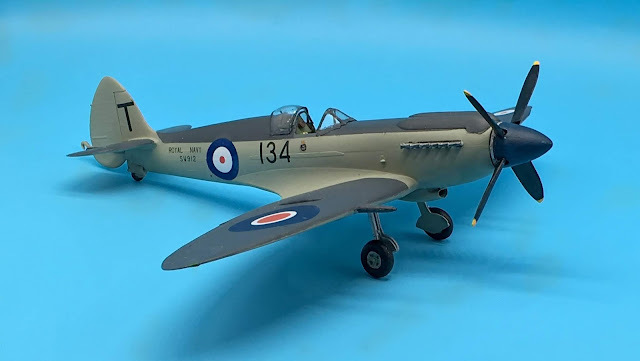 This was probably a bit too late for my mode;, which is a Seafire F Mk XV. However, beggars cannot be choosers. As it is, I am very happy with the final result. The model took a lot of work, being from a short run manufacturer but ended up very tidy. 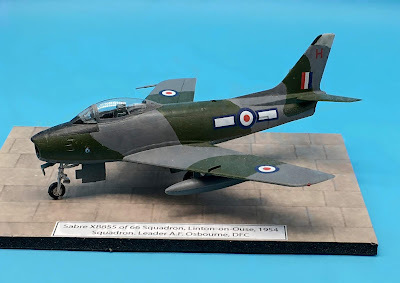 "SW912 is painted in the post-war FAA scheme of extra dark sea grey upper surfaces and Sky Type 'S' fuselage sides and under surfaces to Pattern No. 2. 1-3-5 proportioned post-war roundels were applied but it appears that this aircraft was fitted with a replacement outer wing section from a temperate Sea Scheme camouflaged aircraft, which retained the war period 'Type C' roundel above the wing and the smaller 32 inch diameter 'Type C' on the wing undersurfaces.